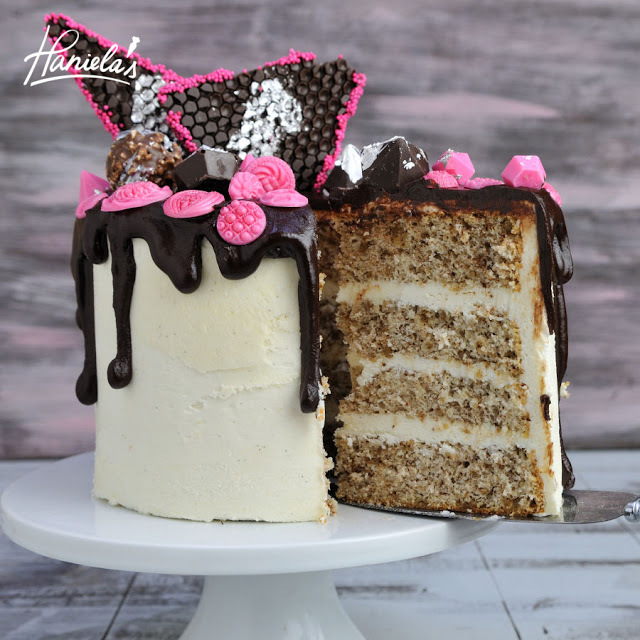 Usually this cake is made into bars, walnut based cake is baked in a sheet pan, cooled and then buttercream is spread on the top followed with a thin layer of melted chocolate. 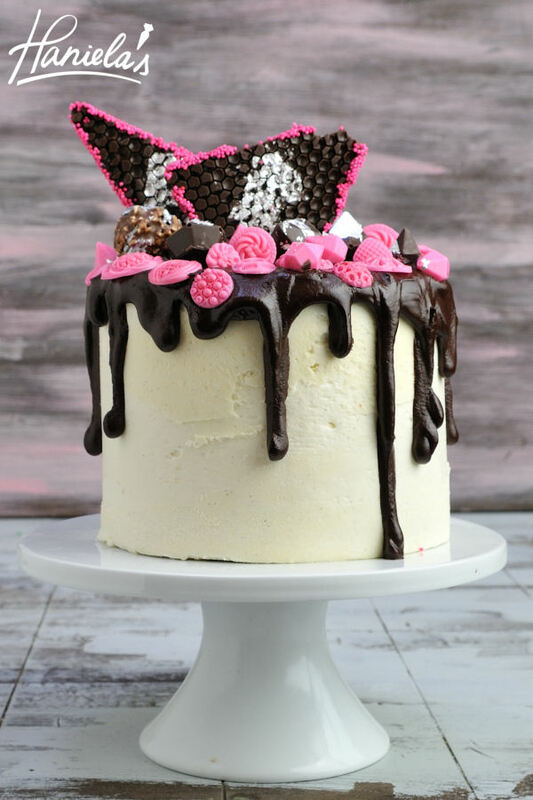 Once chocolate hardens, cake is then carefully cut with hot knife into small bars. I wanted a little change and so I used the same recipe to make a round cake out of it. I ended up using ganache this time which become too thick too fast and my drips are not as fine as I would have liked. Next time I’m definitely either using more heavy cream to make the ganache or using melted chocolate alone. Preheat oven to 350F, butter and flour cake pans or sheet. Beat egg whites with a pinch of a salt until foamy, gradually add about 1/3 of powdered sugar, whip until stiff and glossy peaks are formed, don’t over beat or meringue will become grainy and dry. In the same bowl beat egg yolks with remaining sugar, gradually add warm water and vanilla extract. Bake for 25-30 minutes or until toothpick inserted into the cake comes out clean. Whisk flour into about 1cup milk, until smooth. Add remaining milk. Cook on medium high heat until pudding like texture, cook for 2 minutes, remove from the heat. Strain though fine mesh sieve. Cover with plastic wrap and let cool until room temperature. Beat room temperature butter, add powdered sugar, beat until smooth, gradually add flour pudding. Beat until fluffy and creamy. Beat in vanilla bean paste or vanilla extract if you don’t have vanilla bean paste. Can be made ahead of time, store in the fridge, re-beat if necessary, let come to room temperature before whipping. for 2 minutes. Stir with a wooden spoon until smooth.Pour over cake. If thicker ganache is desired let the ganache thicken. Once on the cake let set for 20 minutes, add the decorations. 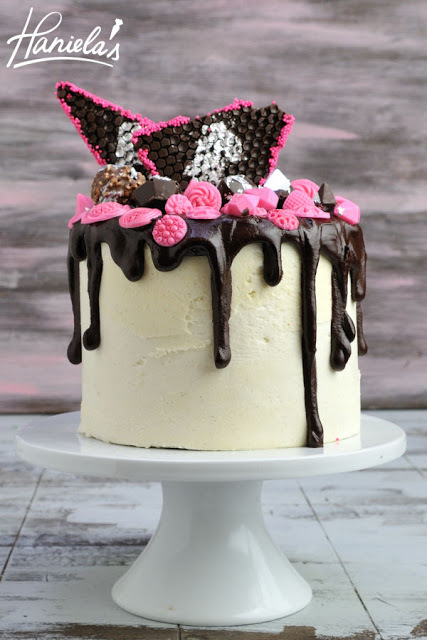 Chocolate Decorations – view the video how to make them. I love all your work! Wish I could actually replicate them… Do you mind telling me the colour brand you use? Thanks. The colours by Wilton I have aren't vibrant at all! ? Hi hani what will the butter taste like if it has flour is is self raising or plain do you sift it? Another winner Hani! I love walnut cakes and meringues. I wish I'd seen your demonstration making flour buttercream, it would've saved a lot of frustrated tears. I can't wait to try it again. Thanks Hani.